Dental disease is the build up of plaque & calculus (the yellow/brown material on teeth). This leads to gingivitis, inflammation of the gums, & the loss of the supportive structures that hold teeth in place, periodontitis. Dental disease is common in dogs and cats, with over 80% of our patients affected. 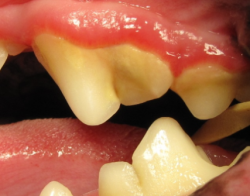 Gingivitis is a reversible condition, however Periodontitis is irreversible. So we need to treat your pet at the gingivitis stage. Bad breath means your pet has dental disease & red gums are painful gums. 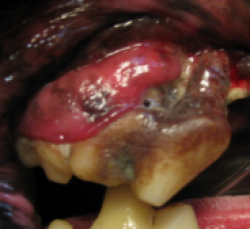 Dental disease is painful and can really compromise your pet’s health. If we do not treat at the Grade 1 Stage then your pet is heading to chronic infection & chronic discomfort. As dental disease progresses, it becomes more involved & more costly to treat. In many cases extractions are necessary. Dogs and cats with good oral health live longer, healthier lives. Unlike human dentists, we do not have the luxury of our patients sitting back, & opening their mouths to allow us to see what is really going on and to treat, so anaesthesia is necessary. Once your pet is anaesthetised a thorough oral examination is performed to accurately assess the extent of oral disease. 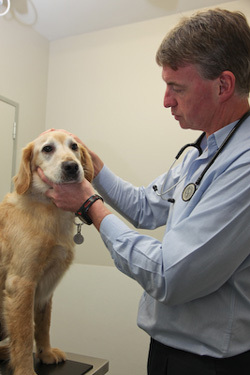 If there is anything unexpected the Vet caring for your pet will call you to discuss what needs to be done. At the 7 day Check we will assess recovery from anaesthesia & discuss Home Care – strategies to help you to slow down the rate at which dental disease recurs. After a Grade 1 treatment your pet receives COMPLIMENTARY 6 monthly Dental Health Checks for LIFE. A HAPPY & healthy pet needs a healthy mouth.